It’s been a while. While Jeremy was on vacation with his family, I was on a mental vacation taking some time to decompress after some heavy work projects. 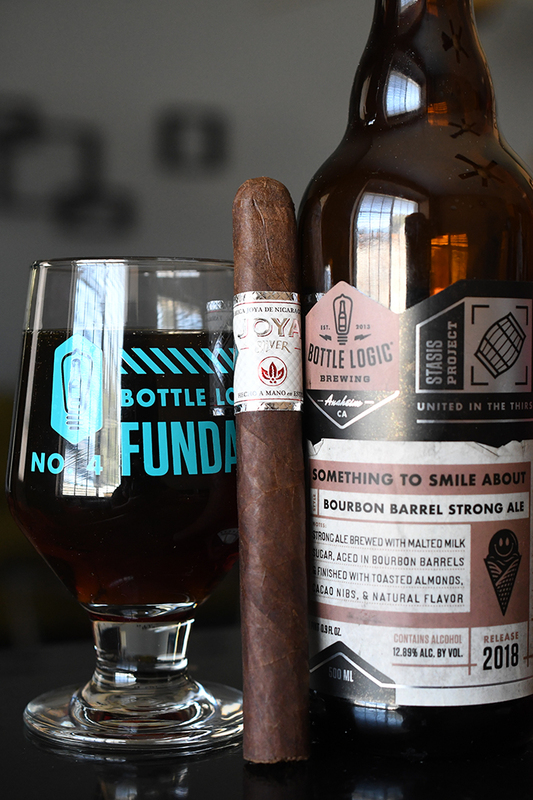 My first pairing back is Joya de Nicaragua’s Joya Silver paired with Bottle Logic’s Something to Smile About. This past year Joya De Nicaragua celebrated its 50th anniversary by releasing two different blends: The Cinco Decadas and the Joya Silver which we are looking at today. 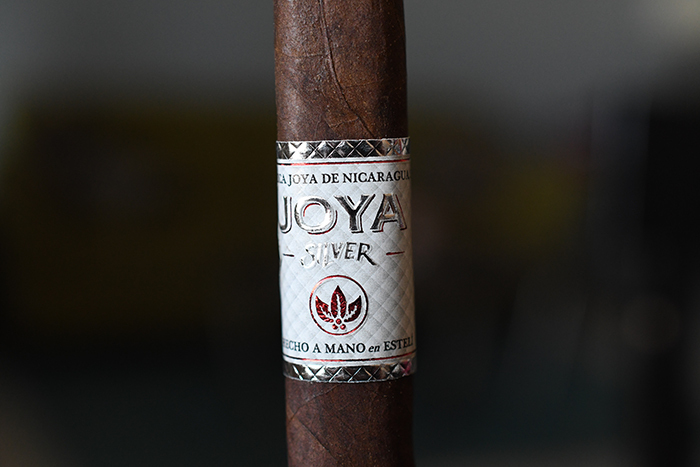 The Joya Silver comes from the Fabrico de Tabacos Joya de Nicaragua S.A. and is composed of an all-Nicaraguan filler bound by a Mexican binder all wrapped up in an Ecuadorian Oscuro wrapper. The Joya De Nicaragua Silver comes in four sizes: Corona (5.5 x 42), Robusto (5 x 50), Toro (6 x 52), and Ultra (6.2 x 46). All sizes come packaged in 20 count boxes ranging before $6.30 and $7.80 a stick. The Joya de Nicaragua Silver starts out with a beautifully dark con consistently brown wrapper. 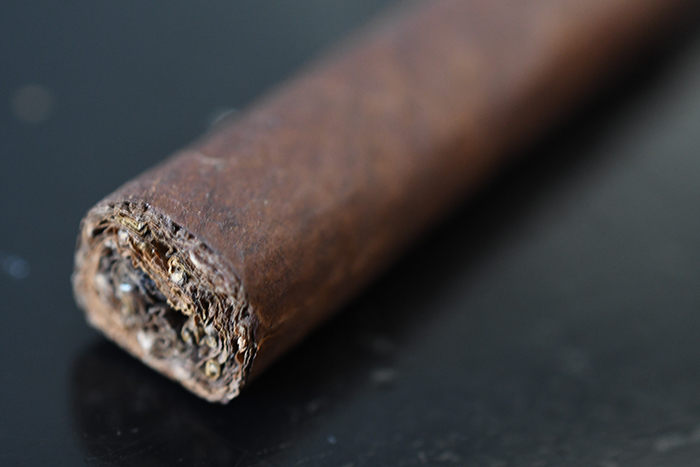 The wrapper is loaded with gritty tooth and a great a mount of oils which makes the cigar shimmer with an orange sheen as the light hits it. 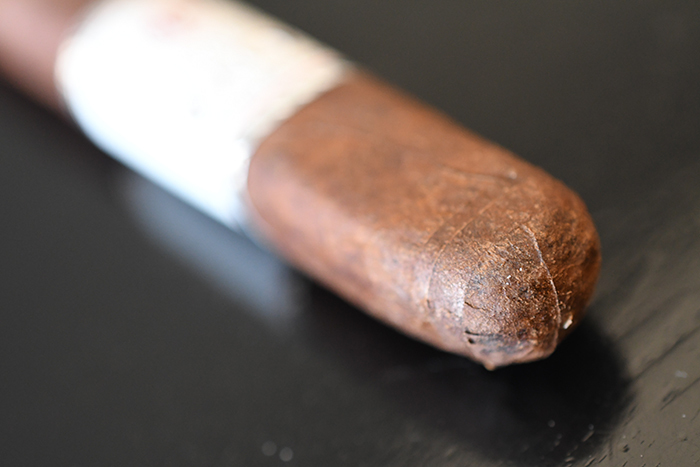 There are a few smaller veins running through the cigar’s long, slender, soft-box-pressed body leading up to it’s round triple-wrapped cap. The cigar is polished off with a beautiful silver, white, and red band. It’s gorgeous. 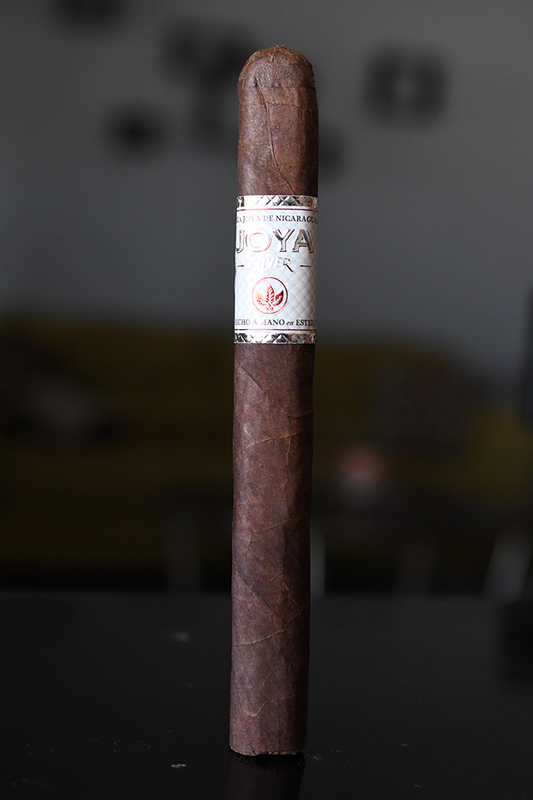 The wrapper on the Joya Silver gives off some great coffee, natural tobacco, and cocoa aromas while the foot of the cigar is much more earthy with notes of spice, dirt, and hay. The cigar cut clean and easily using my Xikar XO double bladed cutter. The cold draw produces strong leather, cocoa, and coffee flavors. 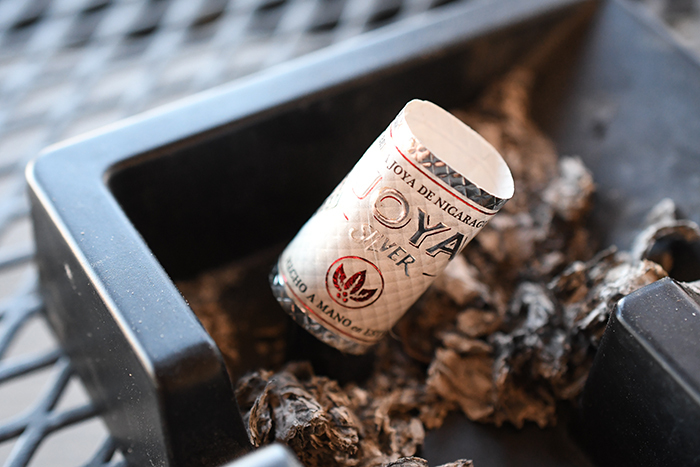 The Joya de Nicaragua Silver starts out with a rush of black and cayenne pepper which held steady for the first few draws before fading back allowing great notes of oak, leather, espresso, pecan, and dirt to come through. The draw is flawless. Each little puff kicks out a great amount of thick, white smoke which stuck around for quite some time before dissipating. The burn line is rather large, but dead even leaving behind a very tightly compacted trail of thick white ash which held solid for about an inch before giving way. Into the second third of the Joya de Nicaragua Silver a really nice floral flavor started to creep it covering itself over the espresso, pecan, leather, and oak. The retrohale really brings the oak and a subtle spice I don’t pick up too pronounced in the normal smoking experience. The burn line is slightly wavy, but nothing concerning. I close out the second third with nothing other than a mild nicotine kick. The Joya Silver really shines in the final third. The floral flavor has gone away leaving me with a very well-balanced mixture of oak, pecan, espresso, cocoa, and leather. The cigar is now right in the middle of the medium/full range. It took me almost two hours to take this cigar down to the nub and I was surprised with how slow it burned. I experienced no harshness nor extended heat. I never once had to reach for me torch to touchup or relight the cigar and I finished the experience with only a very subtle bit of nicotine. Joya De Nicaragua isn’t known for releasing a ton of different blends throughout the year. They take pride and time creating the best blends possible and it shows. 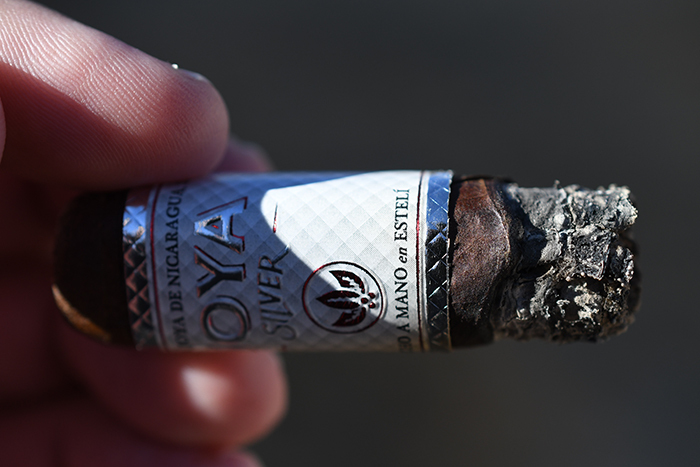 The Joya Silver is a very affordable price that offers a whole ton of bang for the buck. Great profile, excellent burn and construction, easily available and all at a price that won’t break the bank. This is box worthy for sure and something I plan on having around for quite some time. I have been waiting for the perfect cigar to pair Bottle Logic’s Something to Smile About with, and the Joya Silver was just that cigar. The beer is a strong ale brewed with toasted almonds, rich cacao nibs, and marshmallowy Madagascar vanilla coming in at a whopping 12.89% ABV. The beer leads with a ton of chocolate sweetness, malt, vanilla, and wheat with a heavy mouthfeel before finishing even sweeter with tons of chocolate and vanilla, malt, and some slight almond on the aftertaste. These flavors really complimented the espresso, pecan and oak in the cigar. 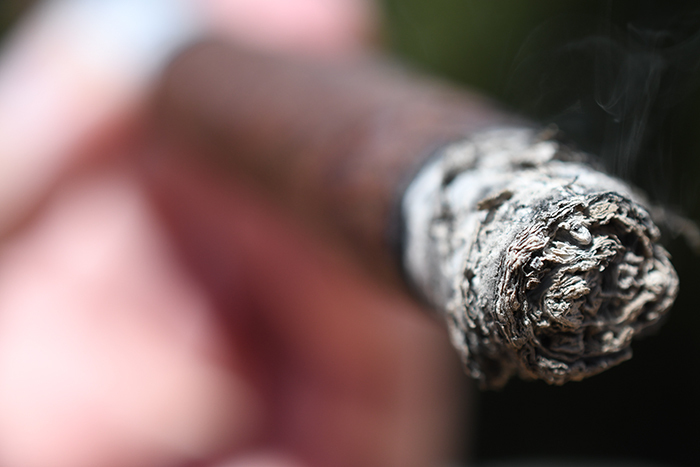 This cigar would also pair wonderfully with some tawny port or spicy rye.